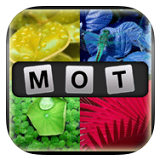 This page contains all the solutions to the game app “1 Mot 4 Images” developed by Igift Store, which is available on the itunes appstore here. **IMPORTANT:** The levels are randomized every time you install the game. Therefore the levels I’m listing below will probably be in the different order than the ones on your device. The best way to find your answer is to use the word solver above – simply enter all the jumbled letters and the number of blanks and you’ll be given one or more possible answers. Then, if you like, you can click on the links below that correspond to those answers to make sure the pics are the same as those in the level you’re wanting to answer. A nouveau, amusant, jeu de puzzle très addictif qui vous tiendra occupé pendant des heures!! Nous présenterons 4 images de vous avoir quelque chose en commun. Vous devez deviner le mot correct. Prenez des notes, des lettres aléatoire ou même de révéler le mot, si vous êtes coincé dans le jeu.